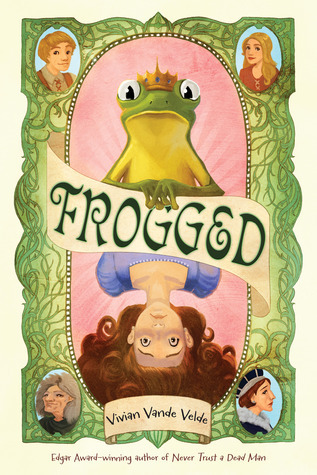 Frogged is an inventive twist on the traditional fairy tale of The Frog Prince. Princess Imogene will be thirteen in two short weeks. Her mother–much to Imogene’s annoyance–has given her a book entitled The Art of Being a Princess, suggesting that she might want to read a chapter every day until her birthday. Frustrated after just the book’s Foreword Princess Imogene takes a walk down to the pond. There she finds a frog who claims to be a prince under an enchantment. He appeals to the princess to break his enchantment by kissing him (which, of course, makes absolute sense in a fairy tale). He will thus be restored to his original royal, human self. Although not thrilled at the prospect of kissing a slimy frog, Princess Imogene is trusting and kind at heart. She agrees to help the frog and kisses him. He is, indeed, restored to his human form–but (1) he is NOT a prince; and (2) he failed to inform her that his enchantment cannot be broken–only passed along. When Imogene kisses the frog and he regains human form she is transformed into a frog in his place. Left to fend for herself since the callous youth who tricked her into taking his place as a frog has no intention of helping her, Imogene must discover her own strengths and ingenuity. She does so in adventures that are by turns funny, harrowing, touching and inspiring. They include an unsympathetic witch, a not-terribly-bright, somewhat boy-crazy farm girl who shows kindness and eventually friendship. Princess Imogene Eustacia Wellington’s stage debut with an awful acting troupe as a talking, “flying” frog in a crow costume is a hilarious highpoint. With an ingenious and deceptively simple conclusion Frogged is a fun, easy read. Its strong female lead is an excellent role model for young readers of both genders in independent thinking, perseverance, and–surprisingly–the graciousness of forgiveness . It’s a brilliant “fractured” fairy tale (one of my favorite genres) and I enjoyed every minute of it!